Two weeks ago I set out in search of great peanut butter cookie. I read blogs, recipe websites, message boards, pretty much anything I could get my hands on. I decided on a recipe that had great reviews, but in my opinion made a less than desirable cookie. It lacked peanut butter flavor and had an odd crumbly texture. I am as anti-crumbly cookie as they come! At that point I decided to try a recipe from All Recipes. Some reviews for this recipe stated that these cookies actually tasted like my favorite Girl Scout cookies, so of course I was curious. I made the first batch according to the instructions. I plopped the cookies down by the teaspoon full and baked for 10 minutes. Well, I ended up with slightly crunchy cookies in irregular shapes. You’ll learn the longer you read My Baking Addiction that I’m a bit of a perfectionist; therefore, along with hating crumbly cookies, I also dislike irregular shaped cookies and I decided to adjust a couple of components. I ended up baking for them about 7 minutes and rolled the cookies into balls before pressing them down with the fork. This happened to work out perfectly! I ended up having soft, chewy, perfectly shaped cookies. 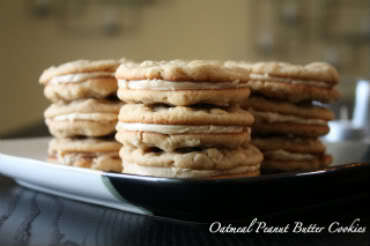 In my opinion, this is hands down my favorite peanut butter cookie – it’s delicious!! 2. In the bowl of a stand mixer, cream together the butter, peanut butter, white sugar, brown sugar, and vanilla until light and fluffy. Beat egg separately by hand, then add to the mix and beat again. 3. In another bowl, combine the flour, baking soda, baking powder, salt, and oatmeal. Whisk them to combine equally. Add these dry ingredients to the creamed mixture and mix on low until evenly combined. 4. Pull by teaspoons and form into round balls with your hands. Drop onto a greased baking sheet, and press each mound down with a fork to form 1/4 inch thick cookies. Bake for 7 minutes, or until light brown. 1. In a stand mixer or with a hand mixer, cream together the butter and peanut butter. 2. Add confectioner's sugar a little at a time until fully incorporated, then add the cream a little at a time until you reach the desired consistency. You may not use all the cream. 3. Spread the filling onto cooled cookies, then combine with a second cookie to form sandwiches. - Cookies store in an airtight container for up to 3 days. Oh yum! What’s the filling? I looks like it’s tasty whatever it is! Wait.. I bet if I read the recipe it would tell me, huh? LOL Sorry, I was just so uber excited!!! These are fabulous. I love peanut butter! Did you post these on MUA? They look so delicious and are on my, ever growing, to bake list! Wow, those look good! What is the filling, if you don’t mind me asking. Wonderful job! The filling is a mixture of confectioners sugar, PB, butter and cream…! Enjoy! I do have one question…how on earth do you make your cookies so pretty? I love the taste but I want them to be pretty too…do you just flatten them with your hand? I used a fork and they aren’t perfectly round now? Also yours look a little thinner…mine came out thicker and it is a really fat peanut butter sandwich…any tips? OH EM GEEEEE! I’ve never seen cookies go so fast. These were amazing. We recently tried little debbies peanut butter sandwich cookies: pretty good and not too sweet. 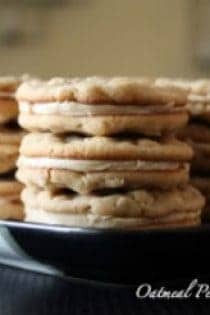 I was looking for a peanut butter sandwich cookie recipe that had no oatmeal, but you’ve done the research, and adding a bit of oatmeal is healthy, so Thank You for this recipe. My adjustments are small, but to me add a bit more health: we use only unbleached flour and only sea salt in all of our baking. Thanks so much for stopping by, Janet!